Russians are waking up in a new country. Last week’s rollercoaster events—Alexey Navalny’s conviction, sentencing, arrest, and quick release, as well as a large street protest in his defense—are a watershed moment in the evolution of the Russian civil spirit. Indeed, of the Russian psyche. Yes, of all Russian politics! In Moscow, political analyst Kirill Rogov writes [ru], “politics has inexorably returned to Russian life.” From Washington, DC, journalist Julia Ioffe proclaims that Navalny has “changed Russian politics” and showed Russians “how not to be afraid.” These grand statements come in advance of Moscow’s September 8 mayoral election, which will pit Navalny against incumbent city chief Sergey Sobyanin. If Navalny has in fact rejuvenated Russian politics, what exactly does that look like online, where his support base is supposedly strongest? Measuring and interpreting answers to this question could go in any number of directions, but a reasonable place to start is with Navalny’s campaign platform, which he published on July 1, 2013. 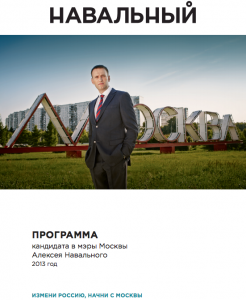 Screenshot of the Navalny platform's title page. Moscow’s official population is roughly 12 million people. If you use the Yandex Blogs search engine, there are over 4,000 results for the words “Navalny” and “platform” (программа) since July 1. Searching specifically for hyperlinks to the full text of Navalny’s platform [ru], meanwhile, turns up 389 hits: it appears 175 times on Twitter and 124 times on LiveJournal, Vkontakte, and similar services (though unfortunately Yandex Blogs does not index Facebook). When Navalny unveiled his platform, he called a press conference and recorded a video of the presentation, which he then posted to YouTube (see below). That video had over 64,000 views by July 19, with about half of that traffic recorded in the first three days after publication. Since July 5, the audience has held steady at about 2,000 views a day, which—if it continues—would lead to around 165,000 total views by election day. In the 124 times that Russians cited Navalny’s platform in full blog posts (that is, on LiveJournal and elsewhere, but not on Twitter), only a handful of bloggers truly interrogated the content of the document. (Most people just posted a link to the platform, or reposted the text of Navalny’s announcement, without adding original commentary.) Searching through those 124 cases, I was able to identify just 21 posts where individuals actually discussed any of the platform’s details—and more than half of them (11) take a negative view of Navalny’s plans for Moscow. Slightly fewer than 30% of the reactions (6) are unambiguously supportive. There are several trends in bloggers’ criticism of Navalny’s platform. People’s concerns generally address four issues: nationalism, qualifications, older generations of Russians, and overlap with Sobyanin’s platform [ru]. Navalny’s critics have always attacked him for harboring excessively nationalist, borderline racist views about the presence of Central Asian migrants working illegally in Russia. In his mayoral platform, Navalny lays out a five-point plan to combat illegal migration, which includes transparency efforts aiming to battle illegally low pay for public services workers, and the creation of “education centers” for the children of migrants, to promote their integration into Moscow schools and learning of the Russian language. Так, Навальный рассчитывает, что публикация штатных расписаний на городских предприятиях позволит частично решить проблему с нелегальной миграцией. Сейчас ситуация с его точки зрения такова: злодеи из префектур и муниципалитетов нанимают таджиков на выделенные на рабочую силу деньги, при этом присваивают какую-то часть этих средств. Мол, я найму Джамшута за десять тысяч рублей, а остальное положу себе в карман. Если же начать платить за ту же работу полную сумму, ту, которая выделена бюджетом, то на место Джамшута явится коренной москвич Иван Иванов, а таджик первым рейсом поедет домой, проливая слёзы. К сожалению, на самом деле эти надежды безосновательны. Ну будут за уборку улиц платить не десять тысяч рублей, а восемнадцать – много ли москвичей бросится на эту работу? So Navalny expects that publishing the staff lists of city facilities will allow him partially to solve the problem of illegal migration. The situation now from his perspective is this: these villains in the prefect’s office and the municipalities are hiring Tajiks, using some of the money allocated to public projects [to pay them], but pocketing the rest. Something like: I’ll hire Dzhamshut for 10 thousand rubles, and I’ll put the rest in my pocket. [But] if we start paying the full amount allocated from the city budget to these services, then in place of Dzhamshut we’ll get native Muscovite Ivan Ivanov, and the Tajik will be on the first plane home, shedding tears. Unfortunately, these hopes are unfounded. When it comes to cleaning the streets, they’re going to pay 18 thousand rubles instead of 10 thousand. How many Muscovites will rush to sign up for such work? Он хочет в Москве сеть видеокамер, чтобы следить за людьми, ЧОП патрулирующий улицы – (голубая мечта неолибералов, заменить полицию на частных охранников). Отдельные школы для детей мигрантов, чтобы изолировать их от детей москвичей. Это будут школы-гетто, типа банту-школ при апартеиде в ЮАР. Взрослых мигрантов предлагается ещё больше ограничить в правах. Для их же блага, конечно. “Создание конкуренции между учреждениями здравоохранения”, принцип “деньги следуют за пациентом” – эти замечательные предложения Навального означают коммерциализацию московской системы здравоохранения. He wants a network of video cameras in Moscow to monitor people, [and] private security firms to patrol the streets (a dream of neoliberals, replacing the police with private guards). [He wants] separate schools for the children of migrants, in order to isolate them from the children of Muscovites. These will become school-ghettos, like the Bantu schools in South Africa under Apartheid. And he proposes even more restrictions on the rights of adult migrants. It’s for their own good, of course. “Creating competition between healthcare agencies”—the principle of “money follows the patient”—these wonderful suggestions by Navalny would mean the commercialization of Moscow’s healthcare system. О возможной замене иностранных граждан мигрантов гражданами российскими, о введении программ преференций по найму российским гражданам и т.п. — ни слова. «Давайте смиримся с тем, что Москва больше не русский город, и будем за наши же деньги „адаптировать“ приехавших из горных аулов диких таджиков, которые и говорят-то с трудом. Ведь нам нужны таджики!». О кавказцах же, убийствах, Манежке и стреляющих свадьбах и вовсе ни слова — такой проблемы нет. About the possible replacement of foreigner migrants by citizens of Russia, about the introduction of a program to give hiring preferences to Russian citizens, and so on—there’s not a word. “Let’s make peace with the fact that Moscow is no longer a Russian city, and use our own money to ‘adapt’ these wild Tajiks, arrived from their mountain villages, who barely speak. After all, we need the Tajiks!” About North Caucasians, the murders, about Manezh and the trigger-happy weddings, there’s absolutely not a word. There is no such problem [according to Navalny’s platform]. Another criticism commonly made of Navalny is that he lacks the experience necessary to hold political office. Navalny’s platform puts front and center his leadership in various anti-corruption efforts (he lists RosPil, his most prominent vehicle, as the first justification for supporting his candidacy), but some bloggers continue to question whether this is sufficient preparation to lead Russia’s capital city. 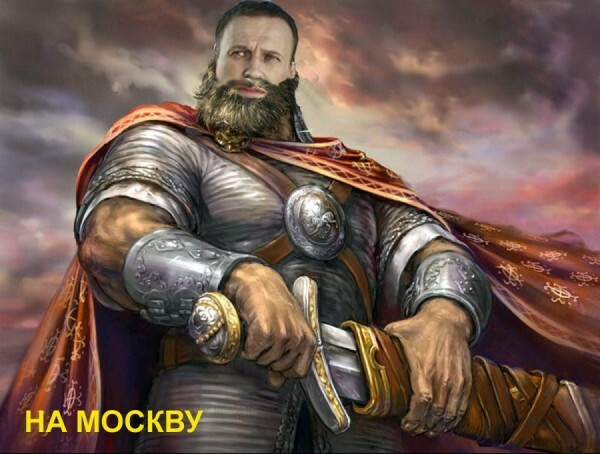 Lebedev has published an entire blog post collecting mockeries of Navalny's campaign materials (like this one), poking fun at the decision to use an unorthodox full circle above the final letter of his surname. А при чем тут мэр Москвы, епта? Иди в налоговую инспекцию, в счетную палату, в минфин, в ФАС, в СК, в прокуратуру – там люди занимаются ровно тем же самым. Предотвращай и дальше. F**k ,what does the mayor of Moscow have to do with anything? Go into tax inspection, the chamber of accounts, the Ministry of Finance, the Anti-Monopoly Service, the Investigative Committee, [or] the prosecutor’s office—there are people there doing exactly the same thing. Go and avert [more corruption] there. […] большей частью в программе идет пиар проекта “РосПил” и позиционирование Алексея как борца с коррупцией. Понятно, что коррупция – это язва на теле нашего государства, но в первую очередь Мэр города должен ведать городским хозяйством, а с коррупцией должны бороться ведомственные органы. […] Понятно, что за этим нужно следить, не допускать и карать, но все же, если только за этим и следить, то можно упустить из вида другие проблемы. […] for the most part, the platform is a PR project for RosPil and portrays Alexey as a warrior against corruption. Yes, corruption is a cancer on the body of our state, but the mayor should firstly be concerned with managing the city’s services and facilities. Fighting corruption falls to the various departments and agencies. […] Yes, we need to monitor, prevent, and punish [corruption], but one might lose sight of other problems, if that’s all he does. Many of Navalny’s ideas about boosting government transparency involve putting more state information online and opening new Internet portals to allow for citizen feedback. While this has been a trend in governments worldwide, both in and outside Russia, some bloggers have expressed concerns that the digitization of municipal services leaves out in the cold older people, who are none too fond of computers or the World Wide Web. В целом, все правильно и звучит на редкость интересно. Но, мне 27 лет и я знаю, как пользоваться компьютером. Моя мама представляет это уже с трудом, моя бабушка боится его, как дьявола. Электронная демократия отсечет их обеих от принятия важных решений (все решения будут принимать молодые компьютерно образованные люди). Штаб волонтёров, созданный в поддержку Алексея Навального идея замечательная, но собираются там, в основном люди до 30 лет. То есть для пенсионеров например, которые представляют сегодня за неимением « движущей силы -рабочего класса» существенную долю избирателей, нет в программе кандидата Навального ничего привлекательного. Лучше чем сегодня им не будет, а хуже вполне возможно. The volunteer headquarters created in support of Alexey Navalny is a wonderful idea, but the people gathering there are mostly under 30-years-old. Meaning, for pensioners, who today represent a fundamental share of the electorate (thanks to the absence of the “driving force of the working class”), there’s nothing at all attractive in candidate-Navalny’s platform. It’s not going to get any better for [pensioners] than it is today, but it could get a whole lot worse. Given the years he’s spent vociferously criticizing the Russian establishment, it is ironic that one of the criticisms now leveled at candidate-Navalny is that his platform is too similar to that of the Kremlin’s handpicked steward of Moscow, Sergey Sobyanin. Indeed, even when it comes to the two contentious policy issues covered above (migrant workers and the expansion of the state’s online disclosures), Sobyanin and Navalny seem to be of one mind [ru]. Yes, there are some areas where Navalny’s ideas differ slightly from Sobyanin’s, like when it comes to restructuring the Moscow government. (Navalny proposes electing justices of the peace, introducing new local financing initiatives, and increasing the authority of the municipalities.) But Sobyanin, albeit more cautiously, favors decentralizing policies, too. Все остальное – переписанные «человеческим языком» разделы программы развития Москвы, взятой с сайта мэрии столицы. Те же обещания «прорыва общественного транспорта столицы», «ликвидации стихийной застройки», «создание системы платной парковки», «создание системы электронных жалоб» и т.д. и т.п. All the rest of it [other than the handful of differences summarized above] are sections from [Sobyanin’s] platform for the development of Moscow, copied over and [rewritten] “in a [more] human language.” It’s the same exact promises: a “breakthrough in public transport,” the “elimination of sporadic construction,” the “creation of a system of paid parking,” the “creation of a system of electronic complaints,” and so on, and so on. Алексей хороший и амбициозный парень и, возможно, у него есть потенциал, но Москвой управляют профессионалы и бюрократия, от которых зависит, будут ли работать водопровод, канализация и транспорт. На данном этапе Навальный не готов взять на себя ответственность за все это. Но тем не менее, ему никто не мешает помогать контролировать все сферы деятельности в которых возможна коррупция и о всех фактах сообщать в правоохранительные органы! Alexey is a good, ambitious guy, and maybe he has potential, but Moscow is managed by professionals and bureaucrats, who determine whether or not the plumbing, the drains, and public transport will work. At this stage, Navalny isn’t ready to take on responsibility for all this. Nevertheless, nobody is stopping him from helping monitor all spheres of activity where corruption is possible, or from conveying any information to the police! There are certainly big limitations to looking at Navalny’s impact on Russian politics in the way I have above. How many people in an election anywhere really study the candidates’ official platforms? Navalny himself, when announcing its publication, jokingly offered [ru] the YouTube summary of his platform to those “too lazy to read it.” Not everyone in the campaign, however, has been so quick to dismiss the platform’s significance. Navalny’s campaign chief, Leonid Volkov, declared [ru] on July 3 that “no political text in the last few months (or even years) has caused so much discussion.” This statement is either inaccurate or a great insult to any recent political texts. Let’s be clear: there are certainly more than 21 people talking about Navalny’s platform. The methodology used to identify that handful of texts was only meant to grab exact citations of the platform’s URL. In an election that affects 12 million people, though, it’s nothing short of astounding that so few bloggers have engaged the document in a substantive way. If Navalny’s base—the Russian blogosphere—is so uninterested in his specific policy ideas (indeed, many of the netizens writing about them in any detail share common reservations), one wonders what the stuff of the “new Russian politics” might be. Indications are that most of Navalny’s supporters seem captivated instead by his personality and his growing dissident credibility (which the Kremlin amplifies with every new court action against him). But if it’s mainly his personal charisma and the odiousness of his opponent that makes Navalny the public’s new darling, what really has changed in Russian politics? It’s nonsensical to refer to Julia Ioffe as a “journalist” and slanders all genuine members of that profession. Ms. Ioffe is a partisan, a propagandist, a cheerleader, and nothing more. She outrageously misreported that a moment of silence that began a street demonstration to commemorate the Bolotnaya uprising was for its victims when in fact it had nothing to do with them. Ioffe’s gross perversion of the facts regarding the opposition movement is deeply harmful to the movement, providing a totally false sense of security and encouraging the status quo ante of failure. As such, she might well be working for the Kremlin. When Navalny sent out over 50,000 invitations on Facebook to protest his conviction in Moscow, only 3,000 showed up. That was a telling insight into his flagging movement. Navalny should have kept on doing what he did best, corruption reporting, and used his popularity to raise money for a real political candidate who could truly bring progressive change to Russia. Instead, he created a personality cult which can’t possibly survive him.